KeenCutEXCALIBUR 1000E 200cm - 78" Excalibur 1000 - Features a single purpose cutter head with interchangeable utility blade, plastic scoring blade and optional glass cutting attachment. The utility blade is ideal for cutting foam centred board, honeycomb plastics, corrugated cardboard, matboard and more and a ratchet device fitted to the head makes it ideal for cutting pvc foamboard up to 13mm (0.5”) easily and without dust. 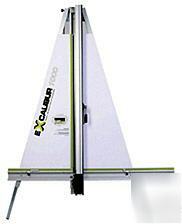 Excalibur 1000E - An extended version of the Excalibur 1000 that provides an economical solution for those people who have the occasional requirement to cut material up to 2m (80”).